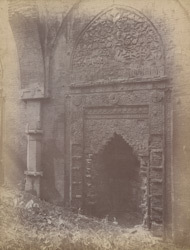 Photograph of blind arches with sculptured niches on the façade of the Daraz Bari mosque, Gaur. The ruined Daraz Bari Masjid (late 15th century), displays many ornamental designs executed in terracotta, among which is an unusual floral design as shown in this view. It represents a parasitic climbing plant that comes out of the trunk of a palm tree and fills all the available space.